The superior imaging and sensing capability of the insects keep the mosquitoes and flies from caught by human beings with bare hands. One of the key factors is that the compound eyes of insects provide multi-spatial-channels optical information for light field imaging and sensing. By capturing the spatial light field, insects with compound-eyes can achieve fast dodging and sudden turns during fling. In order to obtain such capability, people tried very hard to mimic the compound eyes optical system by using micro-lenses array camera in the past. However, the large diameter of lens aperture, the spherical aberration, the inherent chromatic aberration, and the imperfection of the micro-lenses commercially available severely hinder this pursue. Our aim is to realize high quality light field imaging in the visible range for the practical application. Recently, high quality optical imaging obtained from light weight and small size metalenses becomes a trend. In last two years, we have proposed a differential phase equation and edge alignment method for designing broadband achromatic metalens, and have successfully demonstrated perfect achromatic metalens covering the near-infrared and visible-light region [Nature Communications 8, 187 (2017); Nature Nanotechnology 13, 227 (2018)]. These works solved the chromatic aberration issue that has nagged researchers on metalens for a long time. Moreover, the size of achromatic metalens can be easily down scale to the size of the insect compound eyes. In our work, we design and fabricate the achromatic metalens array consisting of GaN resonant nano-antennas for full-color broad-bandwidth optical imaging to open compulsive channel of achromatic light field sensing. The light field can be reconstructed by reorganizing the patches of light field images. The depth information of objects can be obtained by calculating the disparity of neighbor metalenses. The experimentally measured results of moving object demonstrated that the moving velocity of object can be determined, and their all-in-focus images are also obtained by our achromatic metalens array system. Using the standard resolution test chart, we clearly show that our system achieves a superior resolution of 1.95 micrometer for white light imaging as well. 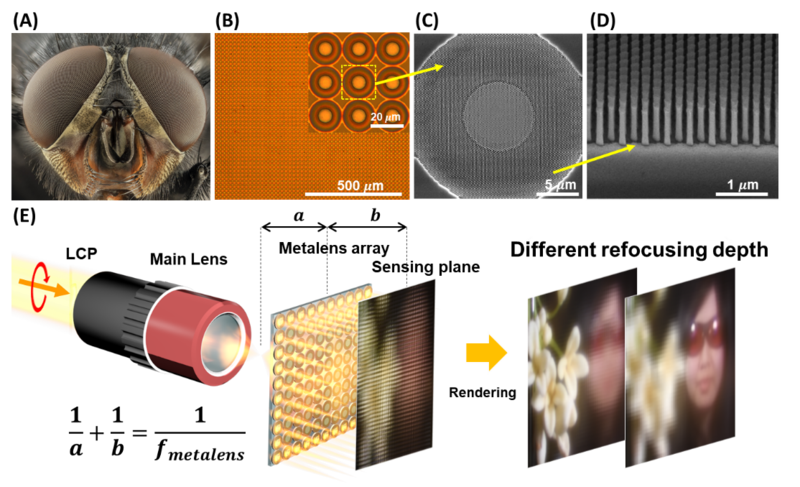 Our work successfully demonstrates the nature inspired metalens array light field imaging and sensing. We trust this is an important milestone of the research of metasurface and metalens, and open an avenue for the future applications of optical meta-devices on micro robotic vision, non-men vehicle sensing, virtual and augmented reality (VR and AR), drone, and miniature personal security system, etc. (B) Optical image of the achromatic metalens array. (C) Scanning electron microscope image of an achromatic metalens. (D) Scanning electron microscope image of the edge of an achromatic metalens. (E) Schematic diagram of light field imaging with achromatic metalens array and rendered images.